Music lovers can look forward to a dynamic spiritual experience in the Songs of Inspiration Concert on April 14, 2019, at the St George’s Garrison Church, Pietermaritzburg. 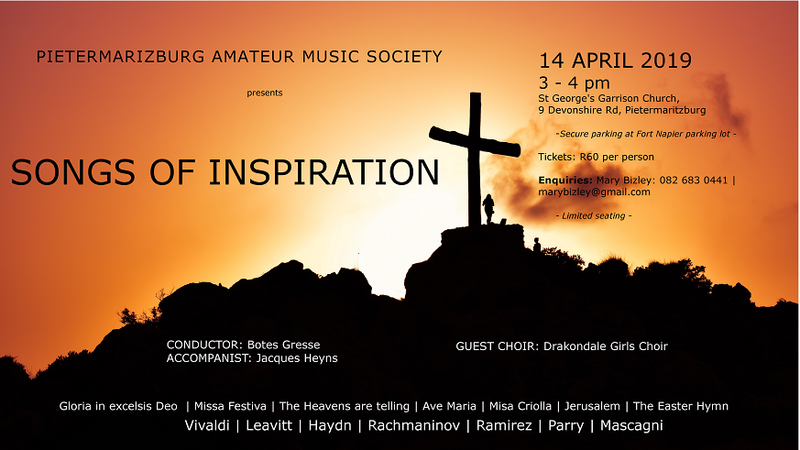 The Pietermaritzburg Amateur Music Society (PAMS) Choir, under the baton of its musical director Botes Gresse, will be singing works of Vivaldi, Parry, Haydn, Rachmaninov, Ramirez and Pietro Mascagni. Jacques Heyns is the accompanist on the piano, with percussion provided by the Pietermaritzburg City Orchestra. The raw, earthy musical beauty of Misa Criolla by Argentinian composer Ariel Ramirez, who set the music within the Latin American folk genre promises to be a real treat. Guitars, drums and tenor soloists, backed by an excited choir create descriptive and striking moods. The PAMS Choir will be joined by singers of South Africa’s only girls’ choir school, the Drakondale Girls Choir, who will be performing John Leavitt’s contemporary Missa Festiva. The two choirs will end the concert with Mascagni’s masterful and intense Easter Hymn from the opera Cavalleria Rusticana. The arrangement is for double choirs and soloists. Tickets R60 available at the door, but seating is limited. Secure parking at the Fort Napier parking lot. 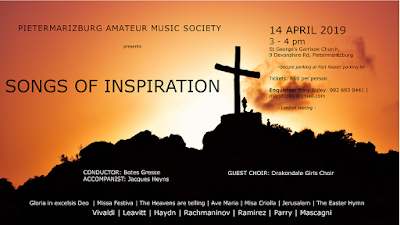 Songs of Inspiration takes place at 15h00 on April 14, 2019, at the St George’s Garrison Church, Pietermaritzburg.